Us for info on larger quantities. 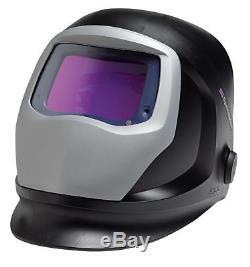 3M Auto Darkening Welding Helmet, Black/Silver, 3M Speedglas 9100, 5, 8, 9 to 13 Lens Shade - 06-0100-10. Auto Darkening Welding Helmet, Lens Shade 5, 8, 9 to 13, Graphics None, Color Black/Silver, Viewing Area 1-13/16" x 3-3/4", Headgear Ratchet, Series 9100, Material PPA, Grind Mode Yes, Number of Arc Sensors 3, ADF Controls Digital, Power Source Battery with Solar Assist, Battery Type LiOn CR 2032 Coin Cell, Battery Life 2800 hr. Features Sensitivity Adjustment Allows Use with All Stick, MIG and TIG Processes, Also Has Grinding and Torch Cutting Modes, Includes 9100V Filter, EN379 Classification 1/1/1/2, Standards ANSI Z87.1-2010. WARNING: California Residents This product can expose you to chemicals including Styrene, which is known to the State of California to cause cancer and birth defects or other reproductive harm. Please note the following may be true on certain items. Item image(s) may be stock photos and may not necessarily depict the exact item you may receive. Certain items cutting oils, valves, showerheads, paints, etc. Are banned for sale in the state of California due to state regulatory acts. The item "3M Auto Darkening Welding Helmet, Black/Silver, 3M Speedglas 9100, 5, 8, 9 to 13" is in sale since Wednesday, January 9, 2019. This item is in the category "Business & Industrial\CNC, Metalworking & Manufacturing\Welding & Soldering Equipment\Welding\Welding Protective Gear\Welding Helmets". The seller is "sustainablesupply" and is located in Anywhere, USA. This item can be shipped to United States, Canada, United Kingdom, Denmark, Romania, Slovakia, Bulgaria, Czech republic, Finland, Hungary, Latvia, Lithuania, Malta, Estonia, Australia, Greece, Portugal, Cyprus, Slovenia, Japan, China, Sweden, South Korea, Indonesia, Taiwan, South africa, Thailand, Belgium, France, Hong Kong, Ireland, Netherlands, Poland, Spain, Italy, Germany, Austria, Bahamas, Israel, Mexico, New Zealand, Philippines, Singapore, Switzerland, Norway, Saudi arabia, Ukraine, United arab emirates, Qatar, Kuwait, Bahrain, Croatia, Chile, Colombia, Costa rica, Panama, Trinidad and tobago, Guatemala, Honduras, Jamaica, Viet nam, Uruguay, Brazil, Antigua and barbuda, Aruba, Belize, Dominica, Saint kitts and nevis, Saint lucia, Turks and caicos islands, Barbados, Bermuda, Brunei darussalam, Bolivia, Ecuador, Guadeloupe, Iceland, Jordan, Cambodia, Sri lanka, Luxembourg, Maldives, Nicaragua, Oman, Peru, Pakistan, Paraguay, Reunion.